I'm trying to just get a basic brush but everything that says 'reset' doesn't rest them (under more button and also under preferences pane)...any other ideas or is this a bug? I'm not sure I understood you. Do you want to reset the application brushes to the default ones? If so the Reset Brushes button in the Preferences, Miscellaneous section should do it. If it doesn't work you can also try to press and hold ⌘ (cmd) while launching the application (from the Launchpad or the Applications folder) tick Reset Brushes from the dialog that will open and press the Clear button. I tried both of those and not working. Should i just try re install? In Affinity Photo 1.5.2 on macOS, sometimes the reset button in the brush editor becomes ineffective. Resetting all brushes in Preferences Miscellaneous as you suggested does repair that, but it obliterates the user's adjustments to every factory brush and eliminates all user-created brushes when all that's desired is to reset one particular brush's settings. That doesn't work - i'm still using this same stupid hair like brush for everything haha. I got about 1 more job in me before i switch out for another program.. I'm sorry for the inconvenience this is causing you. Can you please give me a few more details? Are you using a custom brush or one of those that come with the program? If so which one? I'm trying to reproduce the issue on my system but wasn't able to yet. Still checking this. So yeah, still stuck on this brush, it's been about a year now so i can't remember to be honest however i feel like i ended up there making adjustments to cut around some hair, it never changed back since then. Also experiencing this bug. Once the brush is changed it can NOT be reset. Using the Reset button in this Dialog doesn't do anything. Restarting the application doesn't help. I ended up purchasing a 12 month Photoshop sub. Still using affinity designer but the other one is useless as long as this brush thing keeps happening without explanation. I have been doing a new Udemy course about Photo and as part of this, I was experimenting with tweaking the various brush settings as outlined in the videos about brushes. When I hit the reset button, the original, untweaked settings did not reappear. The only way to get them back was to write them all down ahead of time and manually reset them. When I contacted the instructor about this, he suggested that it might be a bug in the program and suggested contacting Serif tech support. A search for this issue led me to this forum where the issue appears to be unresolved. I understand that I can restore the factory settings through the Preferences menu, but I believe that will also undo any new or customized brushes that I created and want to save. Are my only options to export my own brushes prior to resetting the brushes through this menu? Or to duplicate each brush that I might want to tweak before playing with the settings? Both of these options seem clumsy. So I'm wondering if this is a bug that needs fixing. Thanks for any thoughts about this. Yes, this is a known bug that needs to be fixed (the reset button in the brush editor dialog not working). I will bump our report to bring this to devs attention. Thanks for the quick reply, MEB, and also thanks for bring this to the devs attention. This would be a great bug to fix given the power of the brush tweaking ability. Same issue for me, too. The feature works, until you close the dialogue box for the brush settings the first time. What I mean by that is, you could select a default brush, open the brush editing window, mess around with it as much as you like and the reset button will work as intended. However, if you close the brush editing window, it seems to lose all knowledge of the default settings. In essence, the reset button only remembers the settings from when you last tried to edit the brush, anything prior to that is lost. What it needs is the ability to reset to default settings, or reset to the settings the brush had when you tried to edit it last. That way, you can retain the settings you've applied to the default brush, or revert to the default settings if need be. I had a host of custom brushes I'd downloaded, and using the 'reset brushes' function deletes everything you've ever installed, or created yourself, so avoid it like the plague (unless you have nothing to lose). One click of a button removed many, many hours of time and dedication, so be warned, use it as a last resort, becuase you will lose everything in relation to brushes. I too am having this issue - has it been fixed yet? Thank you!! I've also run into this bug. Very frustrating - please fix. Is this bug fix scheduled for a future release yet? This is still an issue more than a year later!!! Affinity devs.... Mac users can't reset any of the brushes to default after adjusting them. The rest button for the individual brush AND the rest all brushes in preference does not work. This is really really frustrating. Experimenting with and changing brush settings is an important part of digital design work. But you have to be able to get back to baseline to judge what each setting does or even remember what the brush originally can do. The last response from devs on this post is from MAY, it's January now, and this was brought to Affinity's attention in June 2017! Come on now... we need a functioning reset button, please. I had this same issue and found a simple solution. When you got the paint brush tool selected, go to the panels on the right and select the brushes tab (next to colour, swatches, stroke, ...). 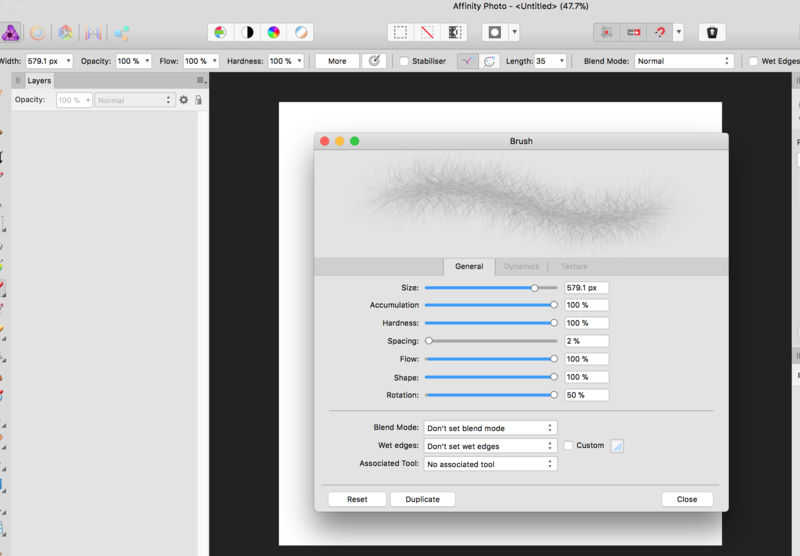 If you select a default brush there, the custom changes you applied are no longer active. I guess they want you to make a custom brush and don't lose it if you accidentally reset the panel (dunno). But his is what fixed my issue! You can later use your custom brush as well! Hope this helps someone stuck with the same issue! I also have this bug on Windows. Actually, reset buttons across Affinity Photo don't do anything at all, not just in this brush area. Pretty bad this has not been fixed since 2017. This was already fixed in the latest 1.7 Customer Betas for Mac, but not on Windows. I've bumped/passed the issue to the dev team. Thanks for bringing this up again.